Welcome to New York Phil Jackson. One day after the Knicks formally introduced the new team President in a Tuesday afternoon Press Conference, and on a day Knicks’ fans decided to hold a protest rally, New York welcomed Mr. Phil Jackson with a 92-86 victory over the Indiana Pacers. The Knicks extended their season high winning streak to seven games, and avoided a season sweep by Indiana. The New York Knicks lead 21-14 after the first quarter, in a very sloppy and ugly opening quarter. Both teams made only six field goals, converting on less than a third of their attempts. Indiana turned the ball over six times in the quarter, yet New York was so inept themselves, that they were not able to capitalize on any of those opportunities. The game was so ugly that for the last three and a half minutes of the first quarter, neither teams made a field goal to end the period. The one saving grace for the Knicks was that they were able to get to the line, and convert free throws, making 9/10 from charity stripe. The field goal draught would continue for both teams, before Lance Stephenson finally made a field goal for the Pacers a little over a minute into the second quarter. Amare Stoudemire finally ended the Knicks’ field goal draught by hitting a mid-range jumper two minutes into the second quarter. This sparked an offensive bonanza out of nowhere for the Knicks, compared to how snail paced the game was going beforehand, going on a 16-2 run, giving the Knicks a 39-23 lead with 6:11 remaining in the second quarter. Stoudemire scored 10 of his 21 points in the second quarter, during the crucial run that gave New York a sixteen point lead in the first half. New York held a 47-35 half time lead, but the Knicks went six and a half minutes in the middle of the third quarter without making a field goal. During this stretch, Roy Hibbert went to work, scoring 14 of his 20 points in the third quarter. Hibbert was jump hooking the Knicks to death, abusing anyone New York threw in front of him. Indiana went on a 17-5 run during New York’s field goal drought, with the five points coming from Carmelo Anthony working hard to get to the free throw line. The run cut the deficit to four points, 58-54 with 3:16 left in the third quarter. Anthony finally ended the Knicks’ misery, converting on a jump shot, and then went head to head with Hibbert, exchanging baskets on the next couple possessions. Pablo Prigioni gave a stagnant Knicks offense some life, scoring five points to end the third quarter. Anthony swarmed by the league leading defense, kicked out to Prigioni for a three, and then after an ill-advised shot by Lance Stephenson, Prigioni cherry picked on the fast break, and got free for a layup, which was goaltended by Evan Turner before time expired in the third quarter. The five points was very much needed, and was an uplifting five points, swinging momentum back to the Knicks, giving New York a 67-62 lead at the end of the third quarter. Indiana would get within one point, scoring the first four points to open up the fourth quarter, but New York would answer with an 8-0 run, to give themselves some breathing room, with a 75-66 lead. 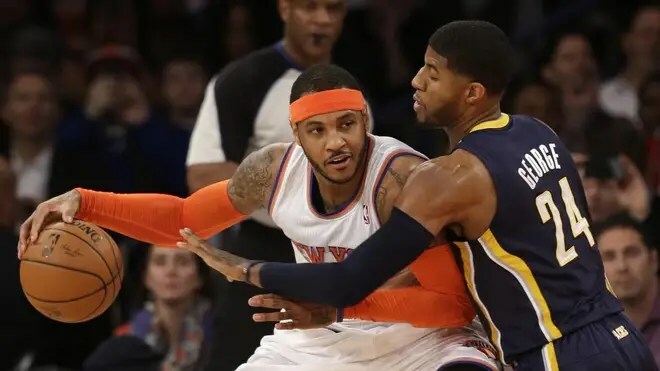 The Pacers would put the pressure back on the Knicks getting within six points, smattering the Knicks with their intense defense. With 3.5 seconds left on the shot clock for the Knicks, a deflected loose ball ended up in Raymond Felton’s hand, who threw up a prayer, and his prayers were answered with a bank in three to give New York a 78-69 lead with 5:48 left in the fourth quarter. Indiana would make three of their five three-pointers in the final five minutes, to keep the game interesting, getting as close as six points with 20.9 seconds left in the game. New York foolishly left Paul George open for a three, and then would foolishly foul George on the next Pacers’ possession, and watched sink all three free throws to get within four, 90-86 with 13.5 seconds to go. Indiana had to play the fouling game, and Tim Hardaway Jr. calmly sank his free throws to give New York their first win in the Phil Jackson Era. Paul George was not able to carry his team to a victory, having as much turnovers as made field goals, going 4/17 from the field for 17 points. Carmelo Anthony on the other hand, continued to carry the Knicks, as he has all season, with 34 points, getting to the line, and getting teammates involved with five assist for a game high +13 +/-.